What is the coolest marine mammal besides the Killer whale? Why the Elephant Seal of course. Elephant seals are the largest species of seal. 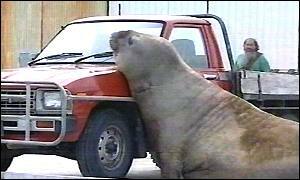 There are two different types of elephant seal (M. leonina ) which live in the Southern hemisphere, Antartica, South Africa etc, and the Northern elephant seal (M. angustirostris) which live, yup you guessed it, in the Northern hemisphere. In places such as Mexico and California they have become famous for coming up on land and smashing peoples vehicles. 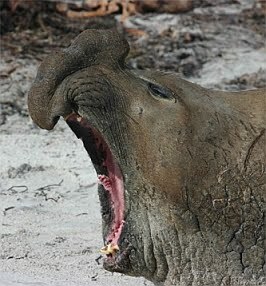 Why are elephant seals so cool? Well first of all the males/bulls are absolutely gigantic. These beasts are the ones with the big proboscis, hence their names. The Southern male elephant seal, weighs over 4 tons (3628kg) and can stretch to 20 feet (6.1m) in length. Yes, they are very, very big boys. The females, who unfortunately lack the cool proboscis, are relatively smaller, coming in at about 1 ton (907kg) and 10ft (3m) to be fair that’s still pretty big...For a girl. Like any successful man, male elephant seals have a harem of up to 50 females which they are constantly defending from other men. Elephant seals are carnivorous eating mostly fish, and the occasional octopus, or sting ray. They have only two natural predators, the two baddest animals on earth, the Great White shark and the Orca.